This is the second and final bake (at least until we eventually start up the challenge again with the next season) from our Star Baker, Cameron! 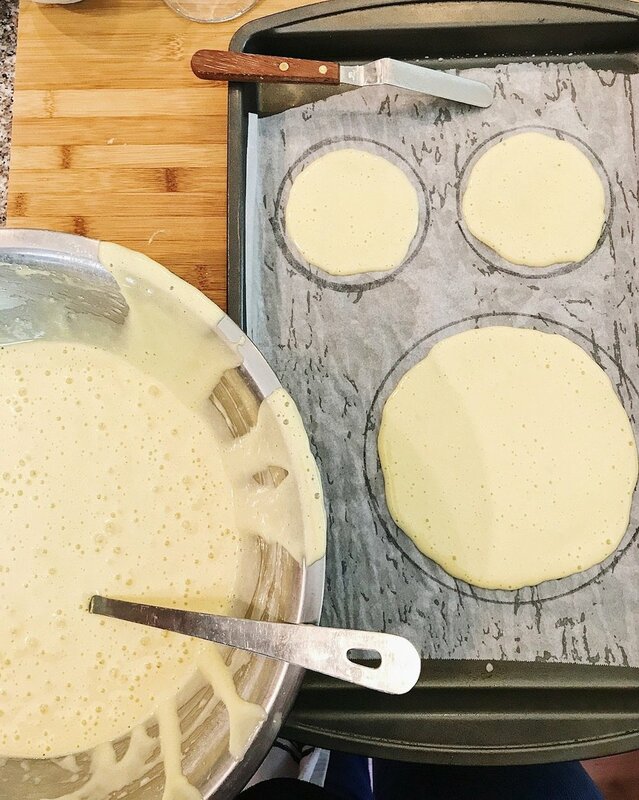 I never know what she has baked up for us until about the day before her post goes live, and let me tell you... when I opened her email my jaw about hit the ground (and so did my husband's!). This is a showstopper to be sure! Be sure and read through Cameron's process of this bake - she is a gifted writer as well as baker, and you feel as if you're watching her as a Great British Bake Off contestant! I have watched and baked along with The Great British Bake Off for years. When Joy sent me the schedule of the episodes that I could select from for my bakes, I thought….now is the time for a challenge. When it came to this post I had narrowed it down between multi-tiered pies and tarts or the decadent dobos torte. Obviously, the legendary Hungarian delicacy would be uncharted territory, so I opted for the challenge rather than the tried and true. I must be honest, once I started ladling layer upon layer of fluffy batter and flattening it with a pallet knife, a little part of me wished I had gone with something more familiar. Now don’t get me wrong, this towering rich cake was delicious and seems more overwhelming than it is! First things first, this is based on Mary Berry’s dobos torte recipe. Never having attempted this bake, I looked to the “Queen” and master for guidance. Notice that I have taken liberties with Mary Berry’s recipe and added my own personal twist to this traditionally chocolate/caramel massively layered torte….a bit “cheeky” I know….but my taste testers validated my deviation from the traditional with resounding “oohs and ahhs”. 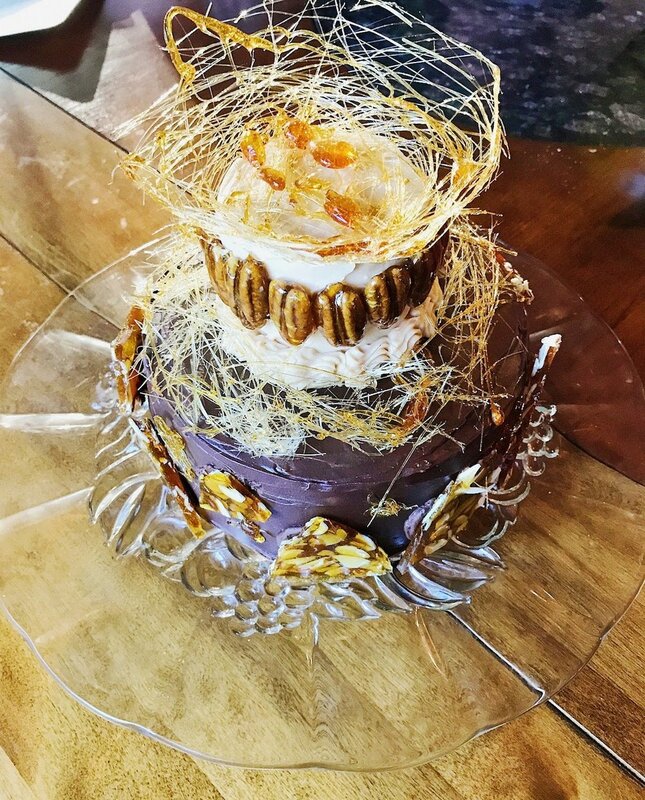 I hope you find the modifications a delight to your palate as well should you also venture into the dobos torte baking adventure. My heartbeat quickened when I saw self-rising flour as a primary ingredient. I’m not sure what it is, but I have never had much luck with self-rising flour or any recipe that calls for it. Often self-rising flour is a component gently folded into light airy egg laden sponge cakes. Nine times out of ten I either over mix the batter and it doesn’t rise or I under mix and have nasty little pockets of flour. This time the stars aligned and everything went according to the plan! I patiently took my time incorporating the flour which resulted in the intended light airy batter. The cake itself is sweet and heavenly, but the real flavor show stopper...an assortment of rich strawberry, caramel, and chocolate buttercream encased in rich silky chocolate ganache. Eye candy…. 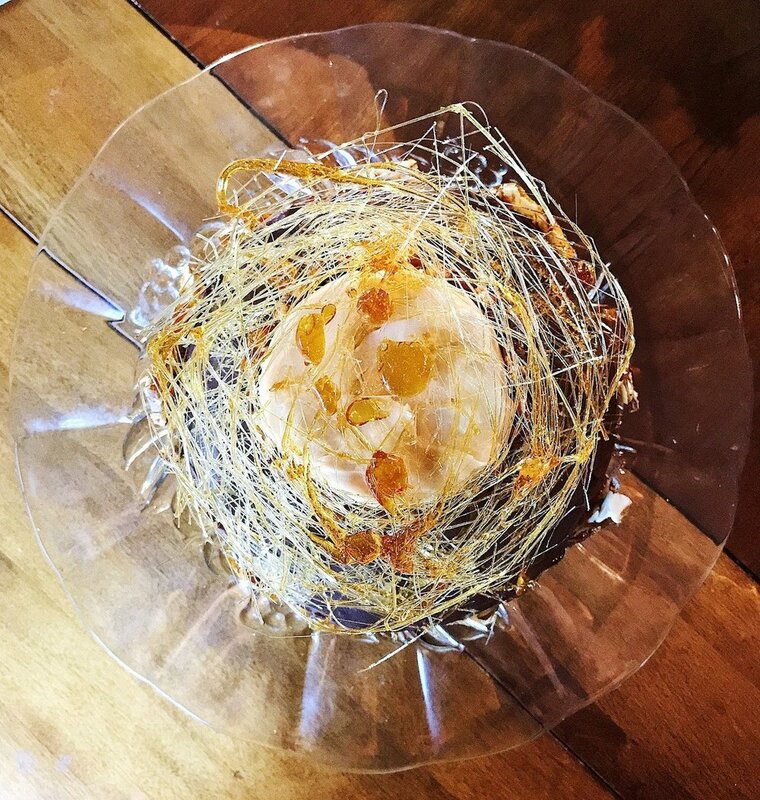 spun caramel golden threads, shards of caramel almond brittle, and caramel dipped pecans. Initially, I wanted something a bit tarter as a juxtaposition to the sweetness of the caramel. My original flavor profile of choice was raspberry. After careful consideration, I had concerns about incorporating a juicy fruit into a buttercream. The multi-layered effect of the dobos is visually appealing but there is a structural weight issue to account for ...a tilted towering bake is not the look I hoped to achieve. This rationale leads me to freeze dried fruit. Unfortunately, I was unable to find freeze dried raspberries and opted for freeze dried strawberries…. a superior substitute! The buttercream legitimately tasted like strawberry ice cream if it were a buttercream! The final personal hurdle of this cake was the caramel. There are few things in this world that I love more than salted caramel. One problem though…. I have the worst luck with caramel! I always burn myself and the caramel turns out crystalized or burnt. It’s an affliction in this life to not be able to make that which one loves to eat! This time however, like the self-rising flour, the stars aligned and everything went beautifully! I did manage to burn myself right at the very end with the caramelized pecans, but it wasn’t anything too traumatic. On this bake, I did allow myself to live on the edge and added a splash of bourbon in the caramel for a little bit of fun…. I would recommend it. It doesn’t blow you away but it does make you feel cozy. Overall this was a bake of personal challenges, and I have to say I’m darn proud of myself and how it turned out. It was decadent and delicious. My “Ottoson Empire” dobos torte was carefully transported to share with co-workers (aka the culinary “test team). By the end of the day...it was fait accompli…. not a crumb nor a dollop of buttercream remained. I don’t think I’ve ever made something that looked so much like a showstopper. Hopefully Mary Berry would be favorably impressed. I’m very pleased with the outcome and would like to challenge everyone else to push themselves outside their comfort zone. *A splash of bourbon optional should you feel adventuresome. In a heavy bottomed pan heat heavy cream until it is at the point of boiling. Keep a close eye on it as you don’t want to scald the cream. Pour the warm cream over the chocolate. It is easier if the chocolate is in a wide shallow bowl so it will melt more easily. Once completely combined and there are no lumps, place in a bowl and allow it to cool and set a bit. In a large heavy bottomed pan combine sugar and 100mL of water. On a low heat stir constantly and dissolve the sugar in the water. Once dissolved increase the heat and allow the mixture to turn a light golden-brown color (at this point you do not want to stir anymore). Once the mixture has reached the ideal color, the darker the color the stronger caramel flavor, remove from the heat and add the 400 mL of heavy cream. Be careful, as the mixture can often spit since you are adding a cool temperature liquid into something very hot. Combine entirely and leave to cool and set. Once the caramel is cold and set you can start to beat the butter with a paddle attachment and slowly add the caramel. I found my buttercream needed a little extra help in reaching the best texture for frosting by the addition of powdered sugar ¼ cup at a time. Fill a piping bag with buttercream and set aside until ready to use. Beat your softened butter with a paddle attachment, then on a low speed add powdered sugar. Once it starts to combine, add vanilla extract, milk, and salt. Once the buttercream comes together add ¾ of the bag of freeze dried strawberries and allow them to break up a bit. Take remaining freeze-dried strawberries and crush them into a powder, then add that powder to the buttercream. This ground up version of the strawberries allows you to intensify the flavor without ruining the texture of the buttercream. Fill a piping bag with buttercream and set aside until ready to use. Beat your softened butter with a paddle attachment, then on a low speed add powdered sugar and cocoa powder. Once it starts to combine add the vanilla extract, milk, and salt. Fill a piping bag with buttercream and set aside until ready to use. Preheat oven to 395 F and line 4 baking sheets with parchment paper. On each parchment paper trace one 8” circle and one 4” circle. You can start off with this and continue to reuse parchment paper or create more circles until you have used all the mixture or have reached your desired number of layers. Sift self-rising flour into a bowl. In a separate bowl, combine the eggs and sugar. Beat until it turns into a pale and fluffy mixture. Once eggs and sugar are combined, sift the self-rising flour in, ½ cup at a time. Be careful combining the flour into the egg mixture, this will prevent losing all the air you just created by beating the egg. Gently move a rubber spatula around the outside of the bowl and then move it thru the middle of the mixture. When the flour is fully combined the mixture will resemble a loose pancake mixture. Using a ladle, spoon mixture into your traced circles and smooth out with a pallet knife. You want the mixture to reach the edges you have traced out so the layers will be easy to trim. Place the baking sheets in the oven and watch carefully as then can overcook quickly, for my gas oven about 9 minutes was all that was needed. Repeat the process until you’ve reached the desired number of layers. Allow the layers to cool, this is pretty quick given the layers are so thin. Take individual 8” layers and lay them on parchment and place an 8” springform base on top and use that as a template to trim any excess off around the edges. Take one layer and place it on a cake stand, using your piping bag with strawberry buttercream (be sure not to use a tip, the strawberry bits will definitely get stuck) pipe buttercream on top of the layer and smooth with a pallet knife. Use the buttercream layers to help straighten any sloping edges. Once everything looks level, place another layer on top and repeat until you’ve reached your ideal height. You want to make sure that the final top layer does not have buttercream on top of it, otherwise it will compromise the smaller layer and be difficult to cover with the ganache. Once the bottom tier is assembled you will want to crumb coat it. This is where the chocolate buttercream comes into play. Crumb coating prevents any loose cake bits disrupting the overall look of your frosting. Cover the entire outside of your bottom tier multi layered 8” inch tier in chocolate buttercream. You can now cover the outside with chocolate ganache and place in the fridge to set. While the 8” base of the torte sets in the fridge, begin assembling the smaller second tier of the torte. You’ll repeat the same frosting concept as the bottom tier only now using the caramel buttercream. This tier does not have a separate frosting as a crumb coat, I just frosted the outside of the cake with buttercream. But if you wanted a more universal look you could also coat it with the ganache topping. On a baking sheet scatter your flaked almonds and using toothpicks, skewer pecans. In a heavy bottom pan combine 400g of sugar and 8 tbsp of water, and on a low heat dissolve the sugar. Once the sugar has dissolved stop stirring and allow it to caramelize, again the darker the color the more flavorful but it can burn very quickly. Once you’ve reached the ideal color, pour 2/3 of your mixture over the almonds and allow to set. The remaining caramel can be used to dip the pecans. Insert a toothpick into the pecan and run through the caramel. Once you have dipped them you can turn them over and insert the pick into an orange or grapefruit which will serve as a sturdy stand and allow them to cool and harden. Allow the caramel to cool completely before handling it to decorate otherwise it will melt the buttercream. To achieve the spun caramel effect, take a metal pick and dip it in the caramel, then quickly move it around an upside-down bowl. This will take some practice to get the temperature of the caramel right so it will start to stick. Keep making circular motions around the bowl until you’ve achieved the look you want. 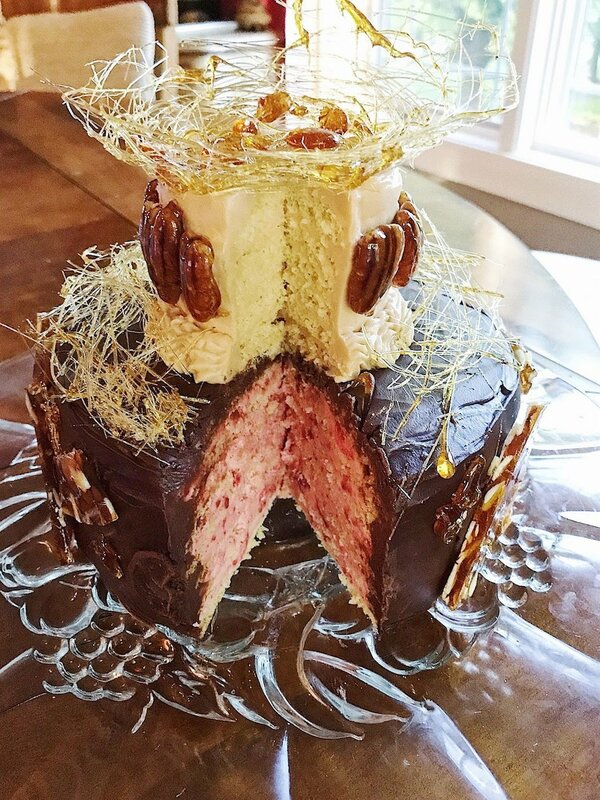 I hope you all are as impressed and inspired as I am over Cameron's torte! For every relatively failed bake I've been having with my mom throughout this challenge, Cameron has made up for it with her incredible prowess and creativity in these showstopper bakes. Don't forget to follow Cameron on Instagram for more mouth-watering bake photos! We're going to do the last three bakes a little differently. On the show, these bakes were done all together as part of the finale show. Because of some travel and general life circumstances, we're going to have these bakes presented together on Wednesday, July 19th... so, you'll really have to hang tight for our little Great Blogger Bake Along Finale!